15 years ago I was in Montana with my best friend Jared and his Dad. We were laying tile at what Jared and I called Chateau Le Green outside of the robust metropolis of Anaconda. No, it wasn't a rain forest. It was Montana. We went were at our motel, Jared and I were hanging out in the room. We might have been reading or watching TV. Bob, Jared's dad, came and got me. He had been on the pay phone with Paula, Jared's mom. I'm not sure of the details but somehow I started talking with my mom. She was distraught. I didn't understand what was going on. My heart sank when she told me what happened. Tanner, my two-year-old brother had gotten into the pool. They were in the hospital. I asked if I needed to come home, my mom didn't know. I had no idea how bad it was. On the drive to Butte we didn't talk much. We drove to the airport. It was closed. It's not a 24 hour airport sort of place. So we stayed the night. I remember asking Jared to pray for my brother, that everything would be okay. I prayed too. I prayed all night long. Propellers cut through the clouds. I stared blankly out my window as the miles passed below me. The tiny plane felt every little bit of turbulence. I didn't really notice. We landed in Salt Lake. I had time to kill so I bought Tyler a white tiger stuffed animal. He had this stuffed cougar and kissed it so much the fuzz was coming off its nose. The little tiger was for Tanner for when he got better. On the flight to Arizona I think some college student sat next to me. She tried to console me. It didn't work. Brianne and the bishop's wife came to pick me up from the airport. That's when it happened. We were getting my baggage. I asked how Tanner was, if he had gotten any better. I remember that exact words, "You mean they didn't tell you? Tanner's not going to make it." I don't know where my sister went. Maybe she was right there. I don't remember if anyone hugged me. I just remember standing there in a building full of people and being so incredibly alone. How could Tan-The-Man be dying? We shared a room. He would come in there all the time, give me a hug and leave. Five minutes later he'd be right back climbing up on my bed, jumping up and down on me. I never got to take a nap. During church I'd hold him in my arms until he fell asleep. Part of me was afraid when I left for Montana that Tanner would kind of forget me. My mom told me before everything happened that Trever had to sleep in my room because Tanner kept pointing to my bed, refusing to sleep. When I left to go on my trip I thought about waking him up to say goodbye. I didn't. He just looked so peaceful. I've regretted that. Oh how I've regretted that. I don't know how to explain it but part of me knew something was going to happen. I went anyway. That was my chance to see my brother smile, to hear him laugh, to even hear him cry would have been a blessing. It was my opportunity to get a Tanner hug. Yes, regret, so much regret. My brother was going to die. Everything sort of washes over you when you hear something like that, at least it did for me. It is so unreal you're not sure how to react. At the hospital I saw Tanner hooked up to the machines, breathing for him. Arms, lifeless. Eyes, closed. Smile, non-existent. In those final moments of my little brother's life we each held him in our arms. But it wasn't the same. I made it just in time to watch him slip away and breathe his last breath. My dad, my poor father. I can't imagine. He didn't make it in time. No one should have to bury their baby brother. Absolutely no one should ever have to bury their child. Amidst all of that pain and soul wrenching anguish I realized I had a choice. I could be angry and bitter at God. Or I could accept His will and His comfort. I chose discipleship. I never doubted for one second that God had the power to restore Tanner to complete health. I never doubted even after his death that He could restore him to life. I never doubted. But it still hurt and so I allowed God to heal my heart, my soul. Since that dreadful day the Spirit of God has seared upon my soul a personal witness of some of His Truths. I know. I don't believe. I know that the spirits of all men, whether they be good or evil, are taken straight home to God. I know God loves His children, He hears and answers prayers and God has not left us comfortless. 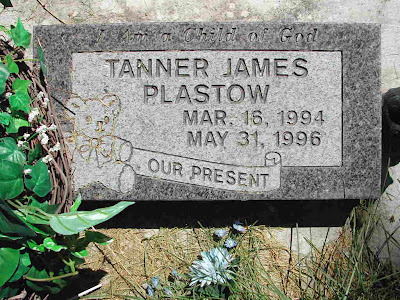 I know families can be together forever, Tanner never stopped being my brother. He is not lost to me. 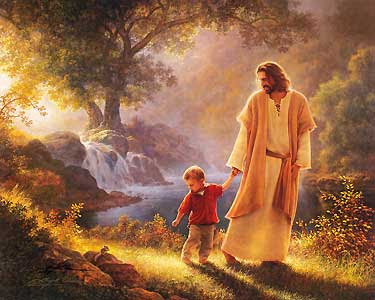 Someday I will see him again, and thanks be to the Savior, not a hair of our head will be lost. I will hug my brother again some day. I know that. I will hug my brother again some day and see his smile. There are some children of God that are too pure for this life. They are taken home before they reach the age of accountability and enter straightway into Heaven. God has saved them from the sorrow of the world. Tanner was such a being. For now he is an angel but he will always be my brother. Life is full of terrible things, of crying alone in dark rooms, of watching innocent loved ones die and suffer from horrible illnesses. But we do not have to go through the great trial alone if we will just turn to Him. Jesus Chris has died for us. And we will live again. Life is so short. 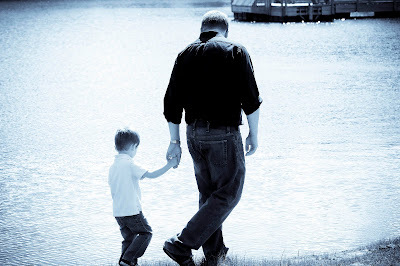 I hope I can pass the test and live to cherish every moment with those I love.